If I had to name one garment that was synonymous with Summer style, it would be the plus size maxi dress. There are just so many things to love of about it that make it the perfect clothing item for the season. The first is just the ease of wear. It is quintessential effortless style and during those warm Summer months, the least amount of effort is much appreciated. Also, a maxi dress is a look all in their own. You don’t really have to add much to it because the work is already done. Lastly, they are super versatile being able to be worn just about anywhere. It’s no secret that I have been a long-time fan of Rachel Roy. I was wearing her clothing even before she had a plus size line, squeezing into any garment that I could. 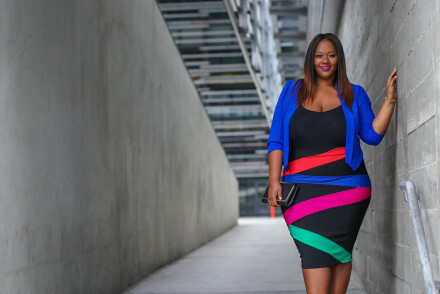 You can imagine my excitement when I found out that she was launching Rachel Roy Curvy and that it would be an extensive of her straight size line with the same great style. So back to this plus size maxi dress. The first thing that I gravitated towards was the print. The colorful florals were understated but still pretty and feminine. I loved how they popped against the grey and I knew that I wanted to pull the color out of it even more. The color that most stuck out to me the most was pink so I went with matching pink sandals and purse to compliment that. I also mentioned earlier how versatile maxi dresses are. I wanted to show that they can be worn in different ways. One of my favorite things to do is to tie the bottom up to the side or the front. It’s just another option of how you can rock your maxi and make it your own. 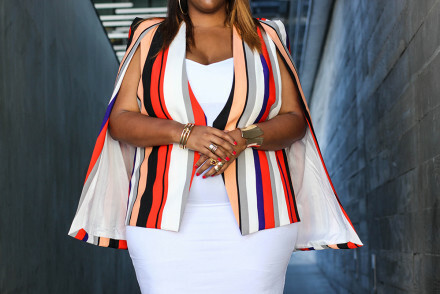 Check out some of my favorites from Rachel Roy Curvy available now at Macy’s below! Very nice dress and summer colors. Thanks for the introduction to Rachel Roy Kristine. You are so welcome Chandra! So glad that I could introduce you to a brand that I love. Much love!